When the ground beneath your feet is shifting, will you stand still or leap forward? Dedicated to celebrating excellence, EY employs over 50,000 tax professionals in over 152 countries. In a rapidly changing business and tax environment, our tax professionals combine agility, diverse thought, tax technical depth and the power of technology and analytics to provide exceptional client service. Are you ready to drive your career forward? You could be on your way to Amsterdam to the Young Tax Professional of the Year competition. The competition is split into three stages. Throughout, we will be looking for evidence of purpose and critical thinking – as well as the practical skills that will mark you out as one of the best. In the first stage, we will challenge you to answer a case study in 750 words or less. Do well here against some of the best minds and you will become a regional winner rewarded with a trip to Melbourne to compete in the Oceania country competition. In the second stage, each regional winner will compete in the Oceania finals where you will participate in individual and group activities. 1st, 2nd and 3rd place receive an EY internship in their respective office. The Oceania overall finalist will also win a place in the global final. Taking place in Amsterdam, the successful Oceania winner will attend the EY Young Tax Professional of the Year (YTPY) International final where you will work closely with people from other cultures and backgrounds from across the world. You will be challenged with individual and group activities in front of EY leaders, clients and academia judges. YTPY finalists will be invited to a prestigious awards ceremony where — after a review of everyone’s performance throughout the competition — the winners will be announced. Terms and conditions for the 2019 competition can be found here. The overall winner, second and third place winners from the Oceania competition will receive an internship opportunity in their local EY office. The overall Oceania winner will travel to Amsterdam, The Netherlands in late 2019 and participate in the International competition. What is the EY Young Tax Professional of the Year (YTPY) Award? The YTPY Award was created by EY to reward and encourage the next generation of tax professionals. YTPY is an innovative program that seeks to reward and encourage the next generation of tax professionals. What is the difference between the EY Tax Consulting Challenge (TCC) and the YTPY competition? The EY Tax Consulting Challenge is the local (Oceania) competition. The YTPY Awards refers to the international competition. What is the difference between the local and the international competition? Participants in each country compete for the country’s national YTPY Award. Each country winner is then eligible to join other country winners during the international final in Europe in late 2019 to compete for the World YTPY Award. The YTPY program started in 2011 and involved nine countries. The program was first launched in Australia in 2015. In 2018, New Zealand joined Australia in the Oceania local competition. In 2018, students and graduates representing over 30 countries competed for the YTPY title in the Netherlands. What kind of guidance are the participants given to prepare for the international competition? Each country winner will have an EY tax professional to act as a local coach, providing insight on tax technical and approaches to case analysis and presentation. At the international event, EY senior tax professionals will be present to provide individualised guidance and feedback. In May 2018 University of Sydney student Samantha Schwarz was named the Oceania winner of the EY Tax Consulting Challenge 2018 and was then named the 2018 EY Young Tax Professional of the Year at the global competition in Amsterdam in November 2018. What has been the highlight of the Young Tax Professional of the Year competition for you? The highlight of the YTPY competition was the entire experience of being in Amsterdam and meeting the other country winners. I also enjoyed being able to learn from experienced tax mentors, including having a partner from the India office as a coach whilst I was there. How did you feel when you found out you were named the 2018 EY Young Tax Professional of the Year at the global competition? I am very excited for my upcoming 30 day trip and the opportunity it presents to meet and learn from some of the current leaders in the tax profession. The chance to experience working in office environments in different countries, as well as to learn about what a career within the tax profession could look like, is also an exciting prospect. What advice would you give to those planning to participate in the competition? The advice I would give to students considering entering the competition would be to definitely give it a go as it's a great experience. Regarding advice for the technical aspects of the competition, I would suggest that when providing case study recommendations remember to be creative and consider all the relevant stakeholders. 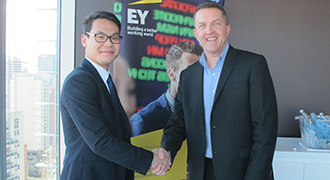 In July 2017 University of New South Wales student Nathan Joeng was named the Australian winner of the EY Young Tax Professional of the Year 2017. The highlight of the competition was being able to meet, compete, and experience Amsterdam with fellow finalists from around the world. I enjoyed the discussions that took place, the river cruise and the competition day as the atmosphere was great and the case study was challenging and fun. Did participating in the Young Tax Professional of the Year competition change your perception of Tax? How? The entire experience from the Australian competition to the international competition has greatly impacted my perception of tax. The competition broadened my outlook on the opportunities in tax and brought to light many interesting topics which I was unaware of such as international tax and tax technology. Also, it has given me further insight into how technology will impact the profession and the tax environment. My advice would be to stay up to date with tax issues, technology, practise presenting and to be prepared to answer further questions on your presentation. 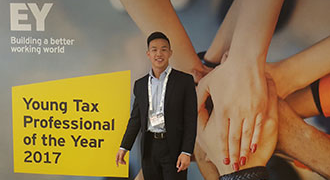 In June UNSW student Nathan Huynh was named the Australian winner of the EY Young Tax Professional of the Year 2015. Nathan enjoyed lunch at the EY Sydney office with Craig Robson, Oceania Tax Leader, Antoinette Elias, George Stamoulos, Tax Partner and Victoria Saunders, Oceania Tax HR Leader. We’ve asked Nathan Huynh, winner of the 2015 Australian Young Tax Professional of the Year (YTPY) to share his experience of participating in the competition. What motivated you to enter? The Australian YTPY competition was based on the taxation of multinational corporations. Given the complex and topical nature, it was extremely appealing to be able to look at the issue in great depth, develop viable strategies and have these strategies critiqued by leading tax partners. What was your approach to tackling the case study? My approach was to first understand the existing taxation structures employed by multinational corporations and what enables the minimisation of liabilities. I then researched the various short and long-term options that have been proposed by academics and professionals. I analysed their viability from economic, commercial and political perspectives. How has your degree/university studies helped you in answering the case? My university studies have taught me how to apply theoretical principles to actual case studies. This has really developed the way I approach problem questions, allowing for a much more holistic and viable solution. Did this experience change your perception of the tax profession? How? Honestly speaking, I initially perceived the tax profession as a bit “dry”. However after completing the YTPY competition, I realised how central taxation is to many facets of business and economics — and how diverse and exciting the profession can be. It really changed my perception. How did you feel when you found out you were the national winner? I’ve always known EY to be a powerhouse amongst the tax professional services organisations, both in Australia and globally. To have my presentation recognised by an organisation of such calibre was extremely humbling and affirming. Would you encourage others to participate in the YTPY competition? Definitely. I feel like my participation in the YTPY competition has allowed me to strengthen both my technical and soft skills. This has been invaluable in my own career development. Also the opportunity to present to experienced partners should not be underestimated. Make sure you do your research and take a systemic approach. The risk of jumping straight into a solution may hinder your ability to present something that is truly reflective of your ability and understanding. 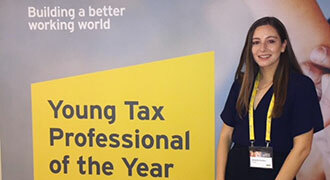 In July 2016 University of South Australia student Grace English was named the Australian winner of the EY Young Tax Professional of the Year 2016. Grace enjoyed lunch at the EY Adelaide office with Tax Partner Sean van der Linden. 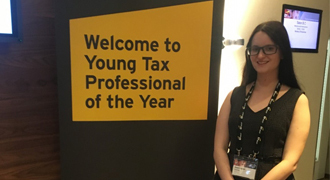 We’ve asked Grace English, winner of the 2016 Australian Young Tax Professional of the Year (YTPY) to share her experience of participating in the competition. The competition presented an opportunity to explore issues in tax beyond the classroom, focusing on more practical and international aspects of taxation. I also saw it as a means to test my knowledge and analytical skills in some of the most interesting areas of taxation. The highlight of the competition was meeting the other finalists. Twenty eight countries participated in the competition, so I was fortunate enough to be able to meet and work with many different people from different backgrounds and cultures. The sessions run by the senior tax professionals from EY from around the world and other business leaders provided me with valuable insights into taxation and business on an international level. My double degree of law and commerce provided me with a good foundation that this competition is based upon, as taxation has both commercial and legal aspects. Absolutely. The competition involved discussions and presentations surrounding the importance of technology and taxation, which really showed me how important and dynamic taxation is. I was ecstatic to find out that I had been shortlisted for the South Australia round of the competition, so to receive the call that I was a finalist in the international competition and would be going to Amsterdam was a dream come true. I would definitely encourage others to participate in this competition. The chance to compete in Amsterdam was an amazing experience. Additionally, participation in the local competition was incredibly beneficial, as I was able to practise and develop new skills. I also found the mentoring process offered prior to the competition very helpful. I would encourage students to focus on presentation skills and developing business acumen as well as the technical taxation skills. Taxation is multidisciplinary and inherent to business activities, so being able to demonstrate an understanding of how businesses work and how you can help clients I see as an advantage.